A major theme for global markets and the global economy is the uncertainty caused by the frictions between the United States and China. It was therefore an initially positive piece of news that the two countries would restart a new round of negotiations that would last for 90 days, that China would pledge to import more US products, and that the US would refrain from raising tariffs on 200 billion dollars’ worth of Chinese goods to 25% at the beginning of the 2019 from their current 10% level. The Fed has been steadily increasing rates, albeit at a snail’s pace, since the end of 2015, taking its Fed Funds target to 2-2.25% from its low post-recession, near-zero target range of 0-0.25%. 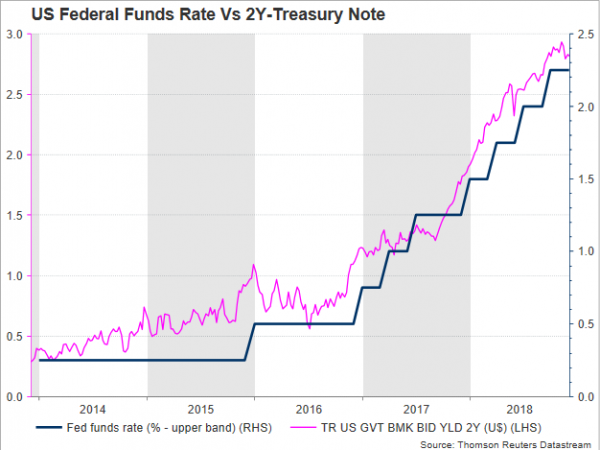 The view that is gaining in popularity however – as reflected by the 2-year US Treasury yield which is a measure of Fed rate hike expectations – is that the Fed has at most an extra 2 or 3 quarter-point hikes before it pauses to take stock. Following a recent speech by Fed Chair Jerome Powell, the number of rate hikes expected for next year has dropped to just 1 – with an additional rate hike largely expected during the December 18-19 meeting in two weeks’ time. If the Fed ends its rate hike cycle sooner than expected, it could provide some support for risk assets while making it more difficult for the US dollar to continue to gain. This in turn could reduce the chances that the dollar will stage a meaningful breakout from its recent ranges against other majors – despite the fact that currencies such as the euro, the yen, the pound and the aussie, are unlikely to receive a boost from their respective central banks anytime soon. To sum up, the Fed might become even more data-dependent the nearer rates come to the so-called ‘neutral rate’. Of course nobody knows what the neutral rate is with certainty, but some economists have suggested it lies between 2.75 and 4%. Therefore, unless inflation looks like getting out of hand, the Fed could be reluctant to push rates higher than say 2.75% for fear of hurting the economy. This in turn might take away some support from the dollar even though other major central banks are way behind the Fed in tightening policy. As Prime Minister May struggles to have her Brexit deal approved by Parliament next, the story of Brexit continues to have many twists and turns which seem to defy predictions. It is not only May’s opponents and critics – both in her own coalition and the opposition – that have taken a negative view of the deal the UK reached with the EU, but the market is also pessimistic that the deal will get through Parliament. How else to explain the lack of enthusiasm for sterling and that pound/dollar just tested its August low, a break of which could lead to a fresh 20-month trough? The market seems to have discounted a negative outcome from next week’s vote in Parliament but is reluctant to push sterling lower or indeed higher unless more clarity is achieved regarding the day after the vote. For example, the range of outcomes is particularly broad; from a repeat of the vote after a few days, to the collapse of the government and new General Elections to a ruling out of a no-deal Brexit and a fresh referendum with a number of options. If negative scenarios materialize such as a government collapse or a march towards a no-deal Brexit, there is still considerable downside for sterling, but more positive outcomes could lend some short-term support to the British currency. The market’s nervousness is evident as sterling jumps up or down with each new headline that comes out. Given that there are hard deadlines ahead however, such as the end of March, the next few weeks should bring some more clarity but for now the uncertainty is sizeable.